Roaming Stamper: Open House Day! Today is the first of my Retirement Open Houses and I'm expecting guests to start arriving any minute. Yesteday I shared a card we'll be making. Today, I'm going to share a little note pad holder. This little jewel uses the retiring Sweet Shapes set. Such a fun and whimsical little set. 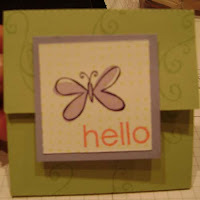 All products from Stampin' Up except Velcro dots, and small note pad. I hope to take some pictures during the event today and will try to post later. I have another Open House tomorrow.